This is an extremely rare variety of the Russian Holistic Medicinal Plant - Golden Tendril. 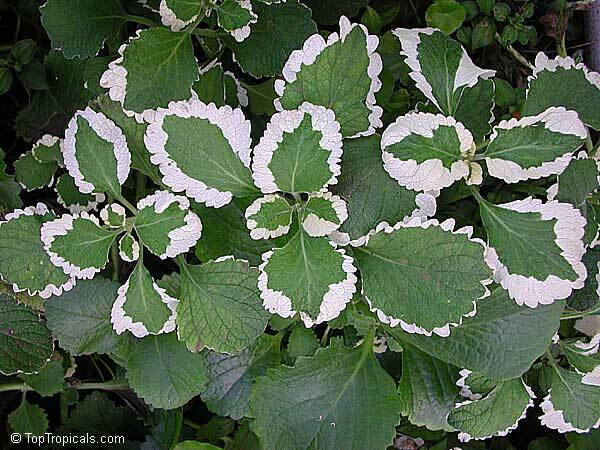 It has showy variegated leaves and makes a beautiful houseplant on top of its medicinal value. It tolerates wide range of conditions and requires very little water; takes both bright sun or shade and is very fast growing and easy. 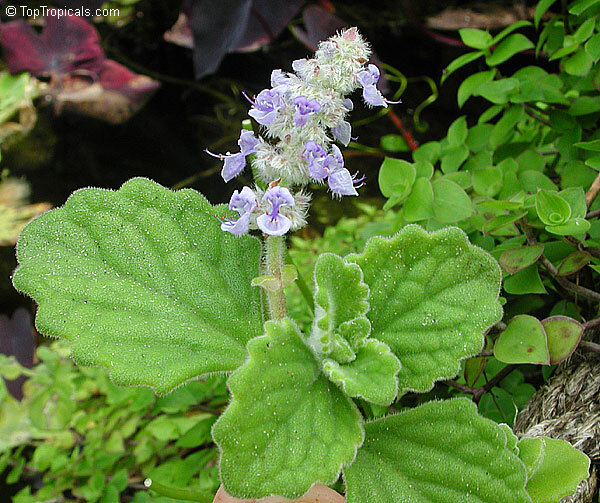 Leaves will turn purplish at the edges when placed in bright light. It has small, white fragrant flowers arranged in clusters of three. 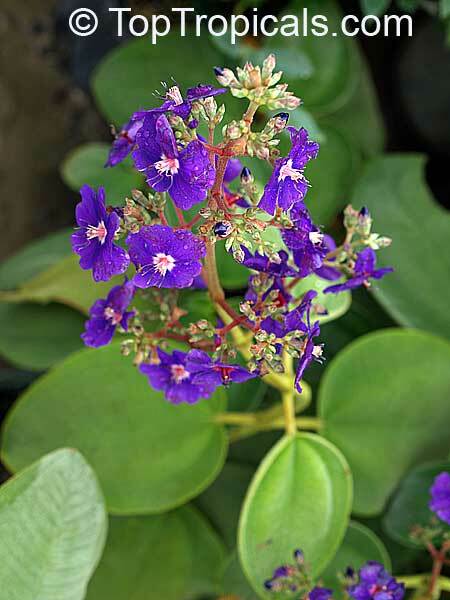 This is a good groundcover for mild, moderately dry climates, as well as a nice container or hanging basket plant. With a good care Callissia fragrans can reach more than 3 feet high as an indoor plant. In this case, you need to make a support to it that the plant wouldn't break under its own weight. The plant has wide medicinal use in Europe and Russia, literally every household, millions of Russians use this plant as a home remedy. According to scientific research, active biological substances from steroid group contained in this plant can struggle with any types of infections, stimulates metabolic processes, strengthens immunity and circulatory system, has a positive influence on growths and much more... some people consider it a virtual panacea. Whether it works for everybody or not, it is definitely fun to own such a legendary plant! Leaves of this showy easy to grow plant are tri-color: with stripes of red, white/yellow and green. 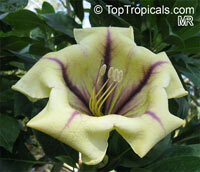 It is very undemanding, requires little water and can tolerate both low or bright light. A popular house plant, too. 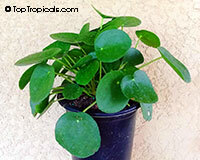 The plant is said to bring good luck and prosperity in the house (Money Plant). 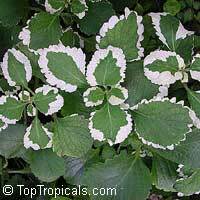 This hybrid produces masses of pure white bracts above finely textured, apple green foliage. 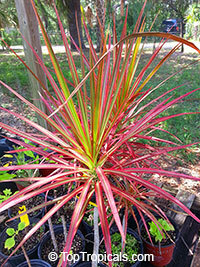 It adds stunning texture and color to a border in full sun or partial shade. Blooms year round. It is delicate and airy and covered with tiny white blooms, an obvious choice for containers as both a spiller and a filler. It also softens walkways and walls. 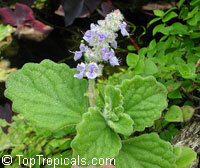 It is a perfect groundcover or a small perennial specimen. This plant is extremely low-maintenance, an absolute workhorse in the garden, blooming almost the entire planting season and with no deadheading needed. Don't let its delicate appearance fool you - it's exceptionally resistant to both heat and frost. 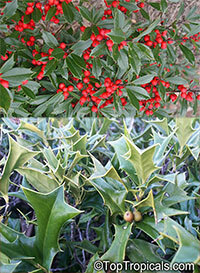 Chinese Holly, Horned Holly. 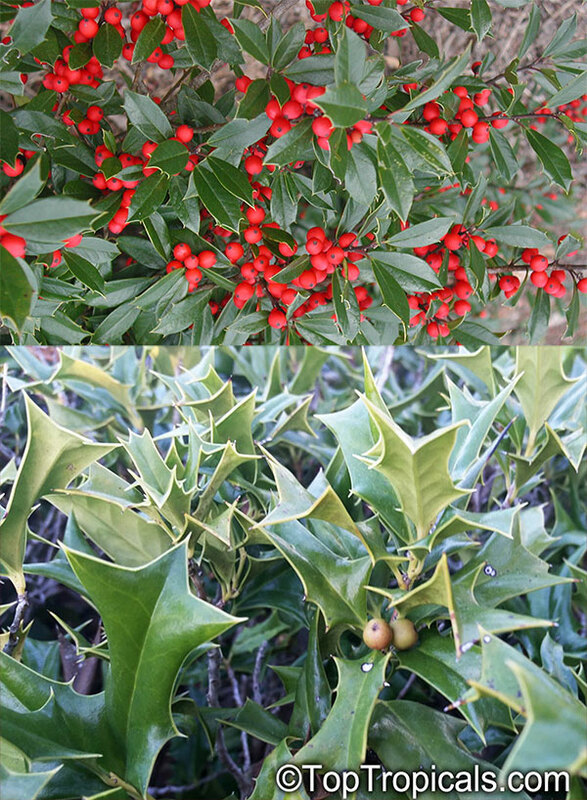 Ilex cornuta is valued horticulturally for its attractive and distinctive rectangular foliage and for its large red berries. 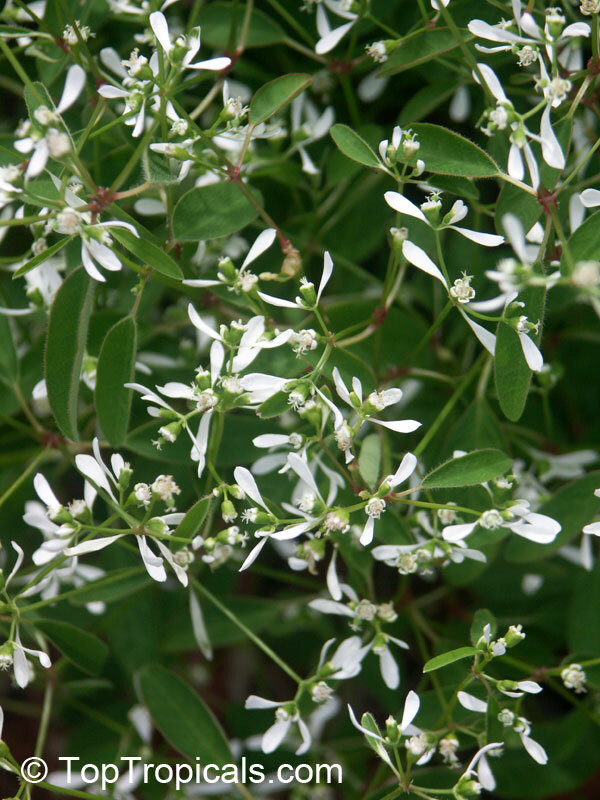 Small white flowers are fragrant and once pollinated give way to red berries. Unusually shaped rectangular leaves have three large spines at the apex. Drought and heat tolerant; use as a small specimen or hedge. 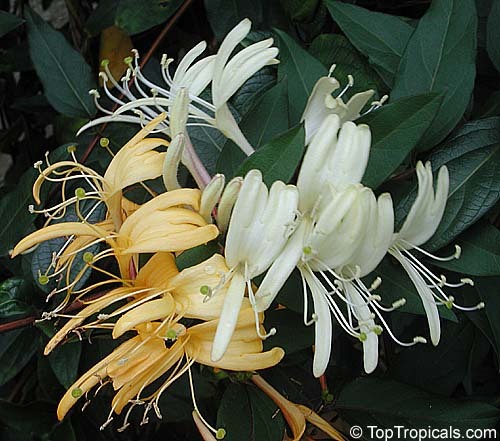 Japanese Honeysuckle, wonderful fragrance! Cold hardy fast growing vine with sweet yellow-and-white flowers from Spring to Fall. You will be rewarded by the attractive white delicately fragrant flowers. Fresh off the tree, the flavor of leaves is unique and fun to use. If you have a Florida Sweet Bay, your cooking will have flavors folks outside Florida can never hope to duplicate. Florida Bay Laurel likes moist, acid soils. 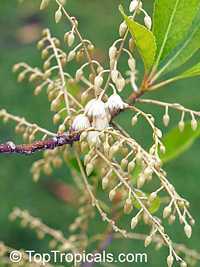 If you use Bay Laurel in your landscape, be sure plenty of water is available. 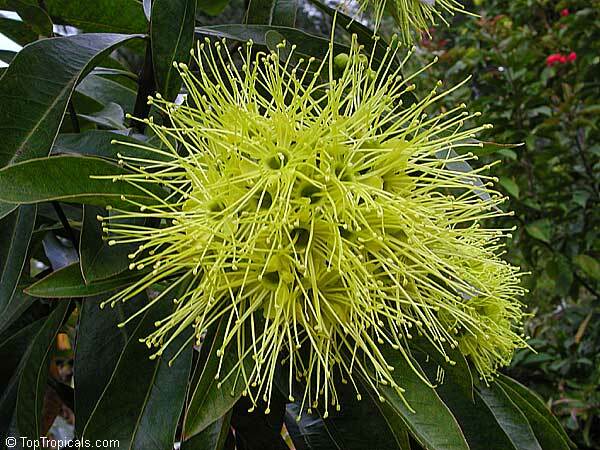 If you have a moist spot on your land, plant this tree. No bugs or other pests. Passion Flower Lady Margaret - impressive mauve flowers, one of the most wanted varieties. Ver fast growing vine, covers a fence or a pagoda in no time. This relative of a Rose receives its name from the fact that young leaves are red, gradually changing to a dark green as they mature. 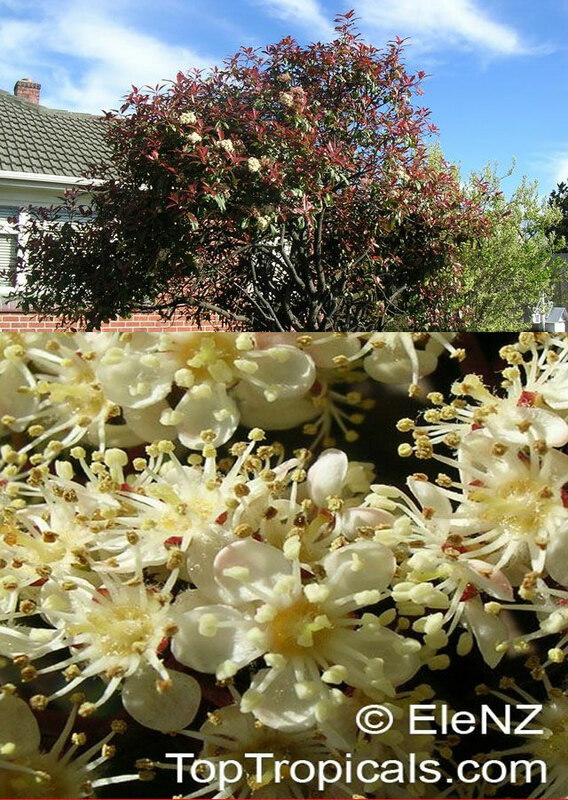 It also has bunshes of pretty white flowers attracting bees and butterflies. The leaves are the starring feature of this plant. Each new leaf that unfurls is a bright shade of red or bronze, but they gradually become a solid dark green as they mature. 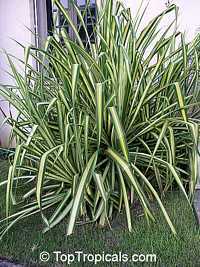 By continually trimming the ends of the shoots, the plant is stimulated to keep producing new leaves throughout the year. 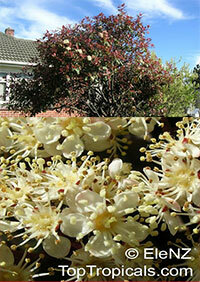 Photinias are very popular ornamental shrubs, grown for their fruit and foliage. Numerous hybrids and cultivars are available; several of the cultivars are selected for their strikingly bright red young leaves in spring and summer. The natural range of these species is restricted to warm temperate Asia, from the Himalaya east to Japan and south to India and Thailand. Chinese Money Plant is a perfect indoor plant that is famous for its lore of attracting money into your life. It is a highly sought-after houseplant and also known as the missionary plant, lefse plant, pancake plant, UFO plant. 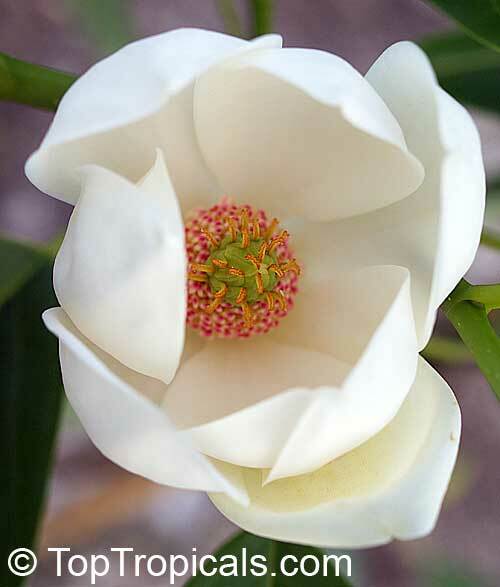 Known for its charming beauty and dwarf size, it is a perfect addition to the windowsill garden. The round, shiny, peltate leaves become mounded as the plant matures and give the appearance of large, green coins stacked on top of one another. 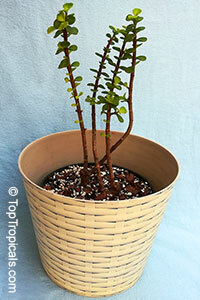 Its adaptation to low light and succulent leaf structure make it an easy-care plant. Camphor plant - previously called as Ocimum kilimanscharicum. Wonderful scent! 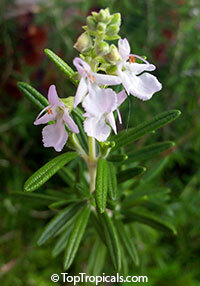 Very rare herb great for ground cover, xeriscape or rock garden, needs no care, grows fast, very drought tolerant. 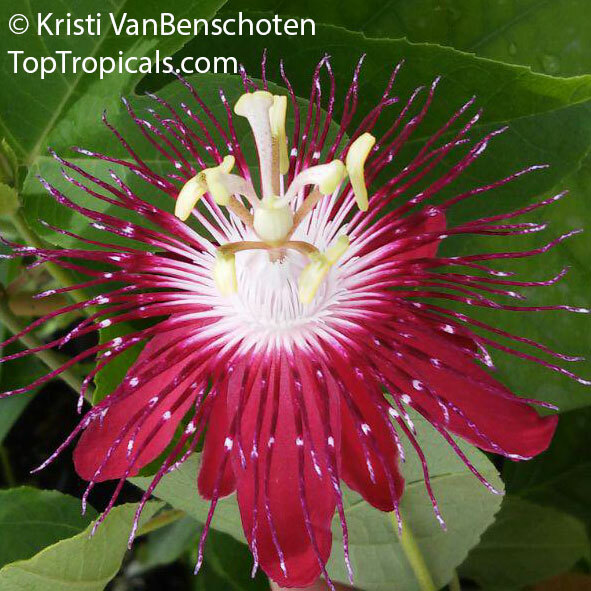 Plant it along walkway and enjoy pleasant scent as you walk by or brush on it. 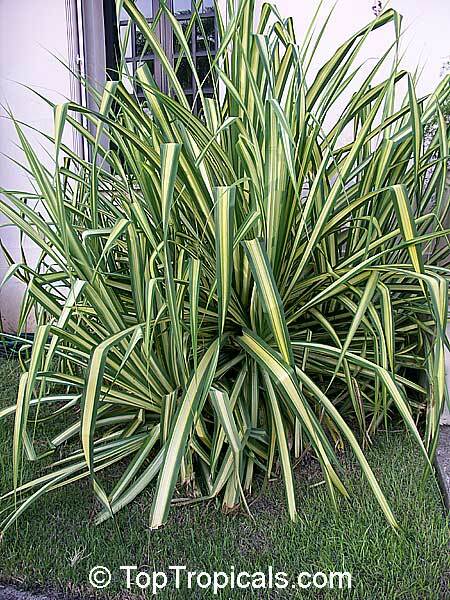 Excellent variagated, fragrant plant that is ideal in mixed containers and patio planters. Can be used in cooking as basil. 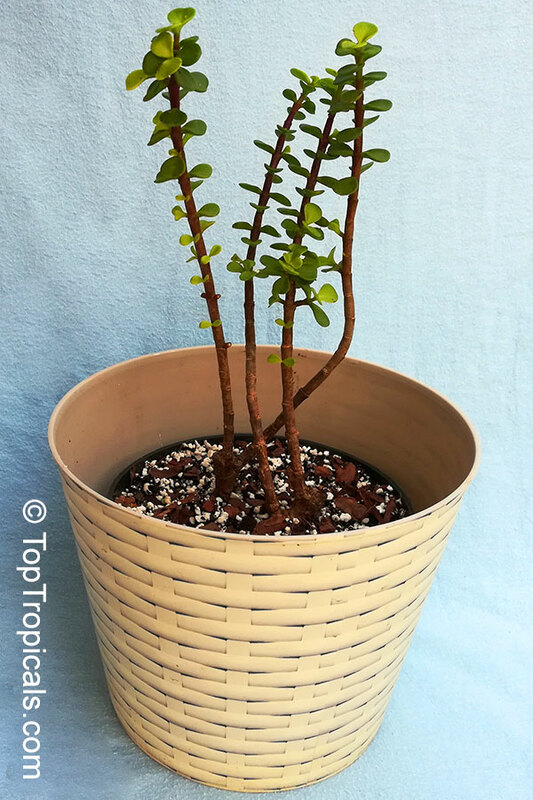 Elephant's Food, Elephant Bush, Baby Jade. 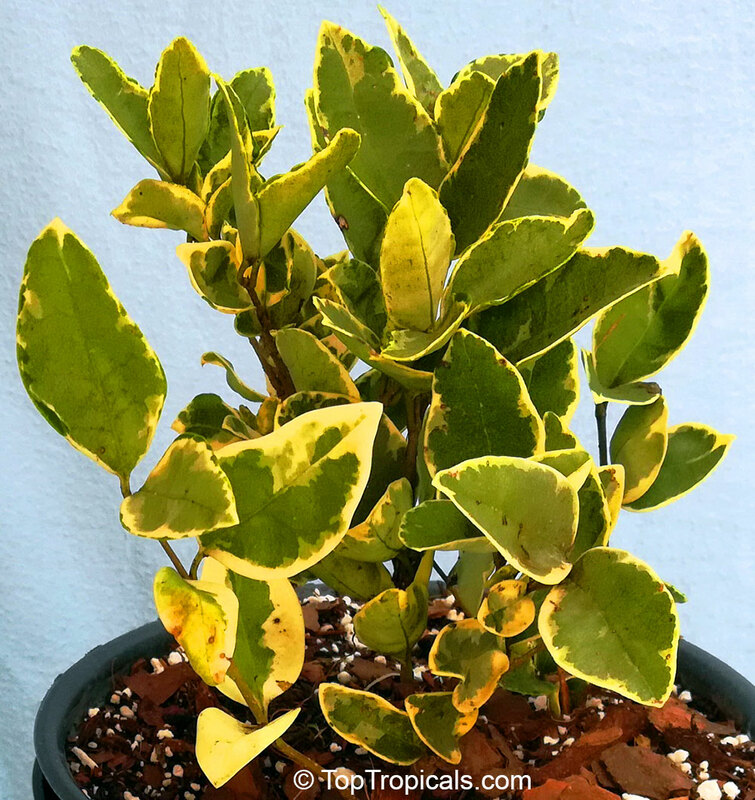 This interesting plant can be used as an indoor bonsai where sunlight or strong artificial light is sufficiently available. The common names derive from the succulent nature of the plant's leaves and stout trunk. The diameter of the trunk can grow to 9" or more. In Africa, it is a favorite food for both Elephants and Rhinoceros, and is grown in farms for feeding both animals and people. The foliage when eaten raw, steamed, lightly boiled, or especially stir-fried, is not only delicious but actually very nutritious, containing more beneficial Beta 3 fatty acids than most fish. Rosemary. 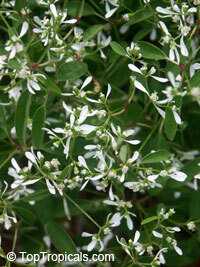 This half hardy perennial forms an evergreen shrub that has been cultivated throughout time for its lovely fragrance. Rosemary does not lose its flavour by long cooking. The fresh leaves have a more pure fragrance and are therefore preferred whenever available. Use rosemary for fish, meat (especially poultry), but also for vegetables. It is frequently recommended for potatoes and suitable for vegetables fried in olive oil. Variegated Butter Cup, Cup of gold. 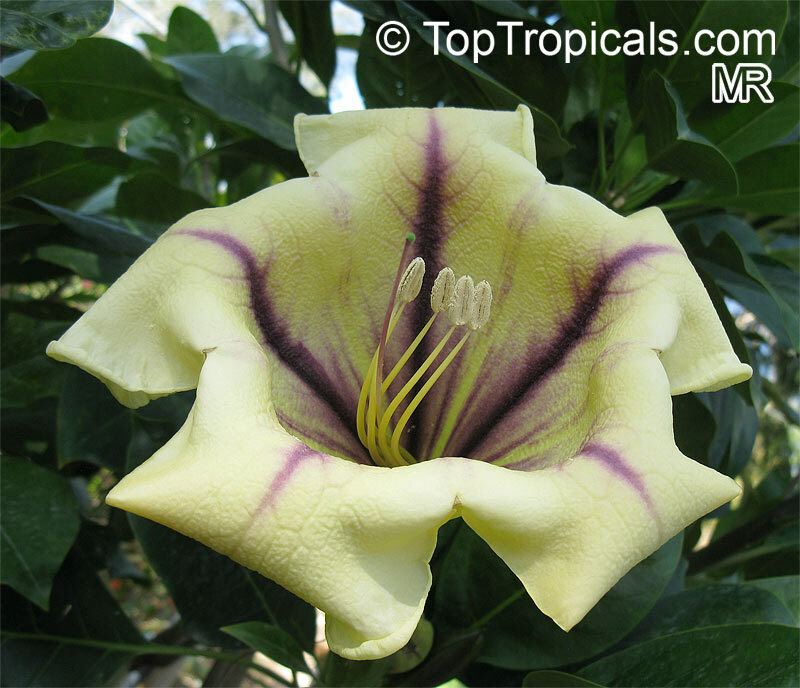 Striking vine with glossy leaves and large showy white to yellow flowers.The flowers are truly spectacular, shaped like a chalice, 6-10" long, flaring open to 4-7" across. 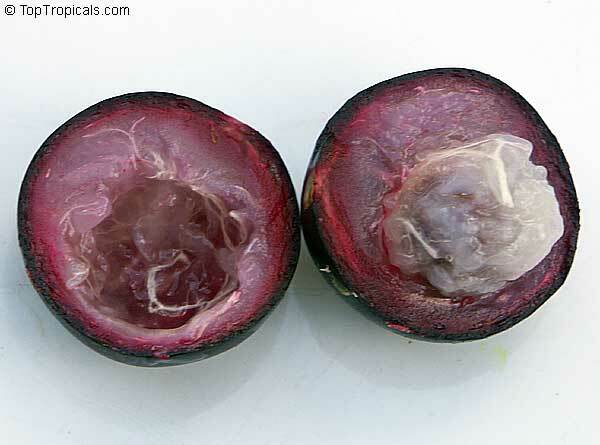 The five lobes of the corolla are reflexed, and each lobe is marked with a narrow purplish brown ridge on the inside. The flowers start out yellow and turn deeper golden as they age. 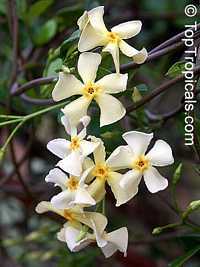 They are fragrant, especially at night, with a scent reminiscent of coconut. Cup of gold blooms intermittently through the year, but mainly in the winter dry season. 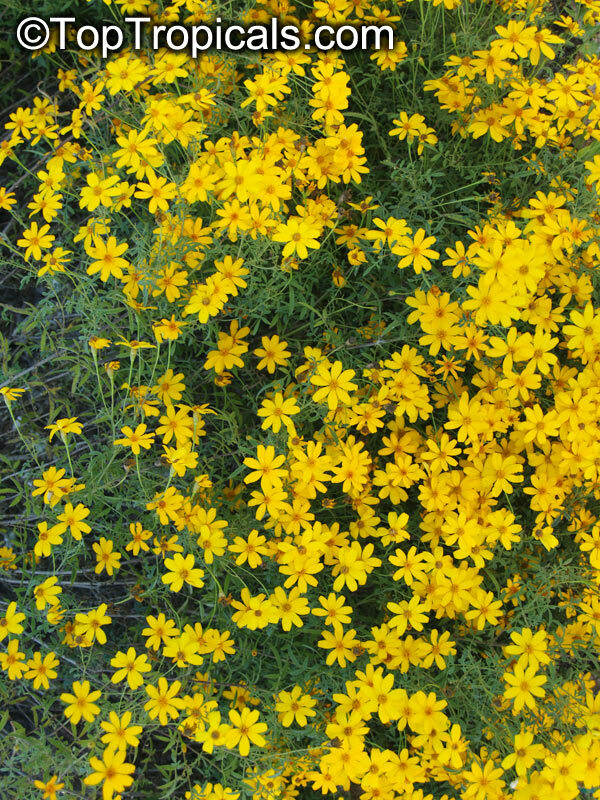 Lemon marigold, Copper Canyon Daisy - usually a small shrub that can be trimmed to a groundcover level, this plant can reach up a few feet if you let it go. 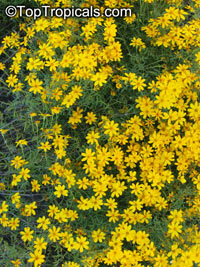 It has very aromatic, airy foliage and vibrant yellow daisy-like blooms. 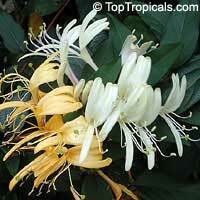 A strong lemon fragrance from the finely divided foliage is released when rubbed or brushed against. Orange-yellow flowers in fall-winter with off bloom in other seasons - flowering is triggered by short day length so overcast weather can extend flowering in spring. 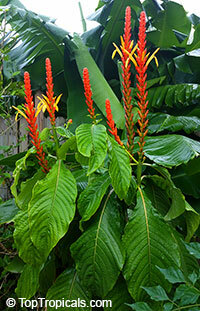 Plant in sun or part shade in well-drained soil. Drought tolerant in coastal gardens but looks best with a little irrigation - too much water or too little light produces leggy plants that don't bloom well. 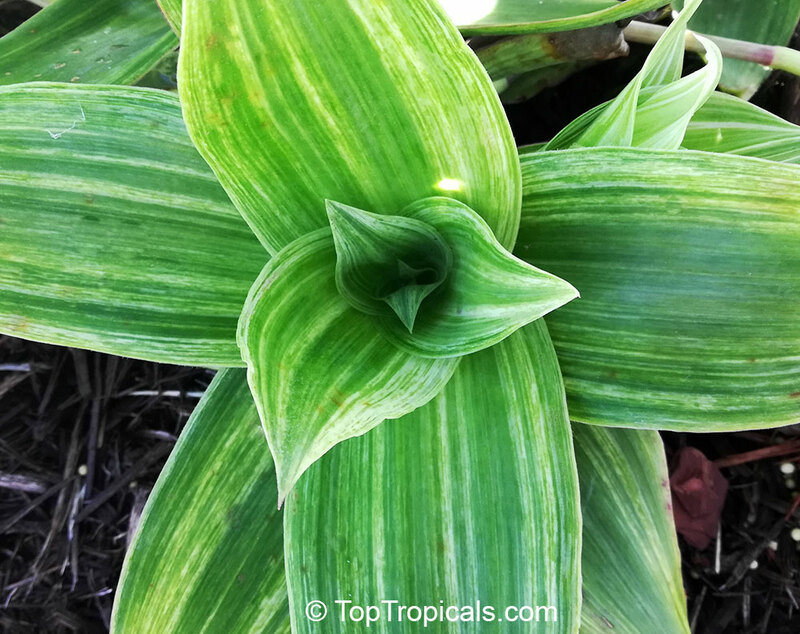 One of the best butterfly attractors! 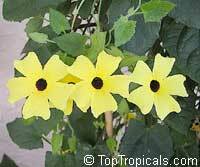 Yellow Black-eyed Susan - a fine fast growing sprawling vine with attractive yellow flowers. Fast growing, easy to grow, not invasive, realtively cold hardy. Spectacular blooms from spring to fall. Glory bush, Quaresmeira. Large shrub or small tree with branching habit and huge velvet fuzzy leaves up to 10" in diameter, nice to touch, tend to turn orange/red at the lower part of the trunk. Spikes of purple flowers. A striking plant! Can be grown in both sun or shade. In shade the leaves grow up to 1 ft in diameter. 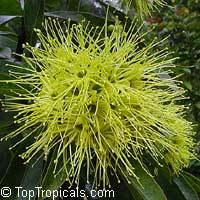 Golden Penda - outstanding small tree with golden flowers that have sweet fragrance! Blooming size. Very rare and difficult to propagate species.